Traditional archery has been a big part of my family, long before my Dad started this business. I have fond memories of my cousins Chad and Tyler coming to our house for an entire day of arrow making. Chad was 5 years older than me and he often drove to our house to pick up my brother and I in order to go fishing, hunting, or pretty much anything. Even though he moved to Nebraska, Chad has done a pretty danged good job of killing the elk over the past few years (for 8 years in a row he shot at or killed an elk on opening day, this year it took him five days), so I asked him to write me a story about his season. 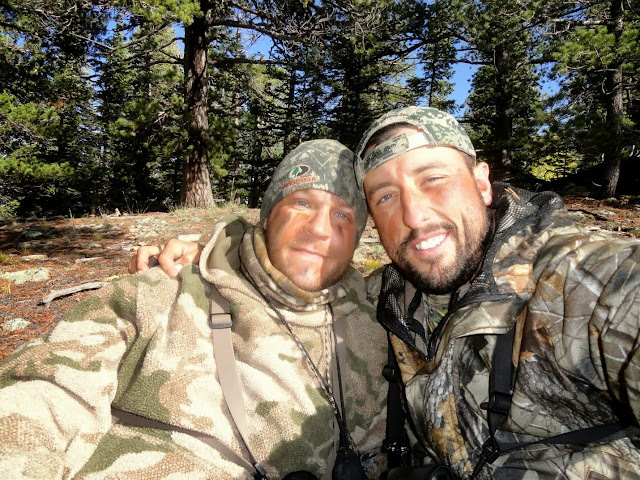 Here is Chad's story, in his own words...followed up by good friend Devlin's account of his first experience chasing elk. This year's preparation for elk season started in February when my hunting partner, Blake, and I began planning a hunt in an entirely new area. 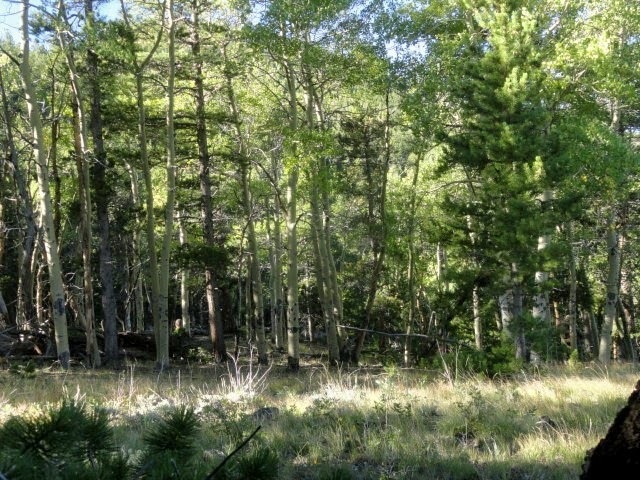 A big part about elk hunting that I love is exploring new Wilderness Areas. In fact, in the past ten years, I have not hunted the same place twice. 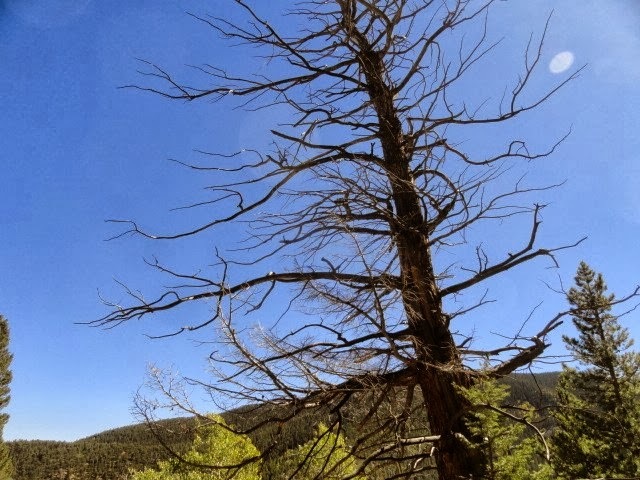 This year's focus was in southern Colorado. 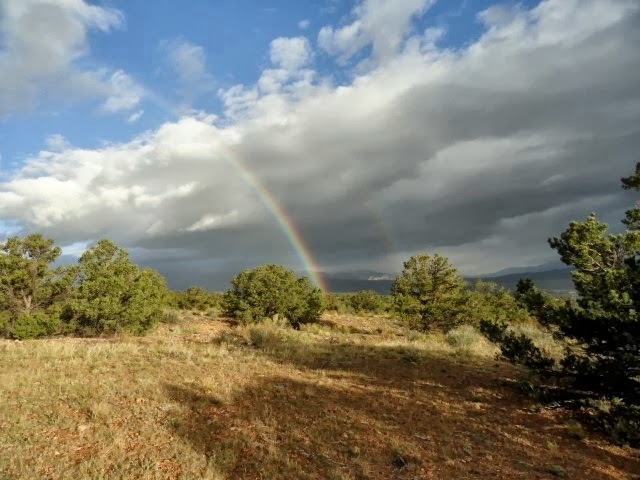 We had a good selection between the San Juans, Weminuche and the Sangre De Cristos. Sometime in early spring we decided to invite a friend, Devlin, after his wife revealed to me that going elk hunting has been his lifelong dream. After hours of looking at maps, studying harvest statistics, and conversations with the local forest departments, we settled on a destination. It was toss up in the end as all three areas appear to be phenomenal. 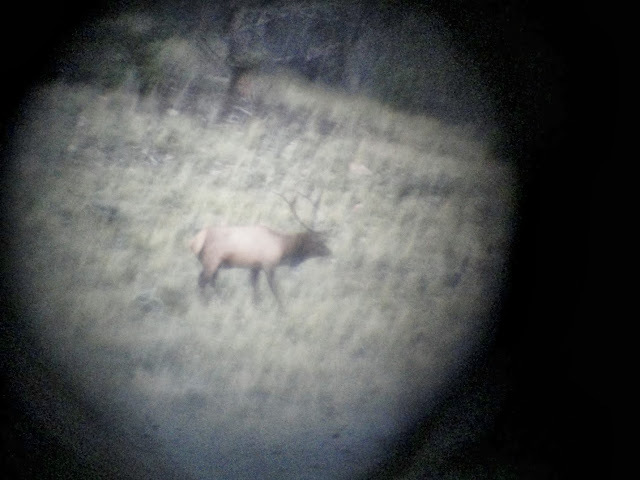 We took a scouting trip two weeks before elk season and were surprised to find 20 bulls during the course of a 2 day trip. It was exciting to see a good number of elk in the area we planned to hunt. 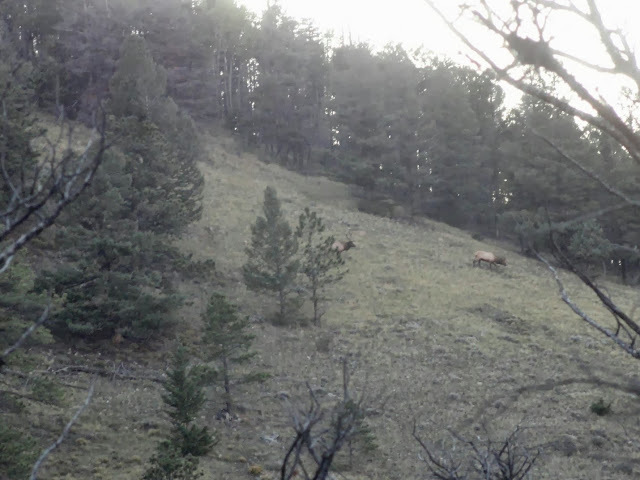 The only thing we didn't know was if the elk would be there during the last week of the season, which is when we planned our hunt. We also discovered that these mountains are steep, very steep. 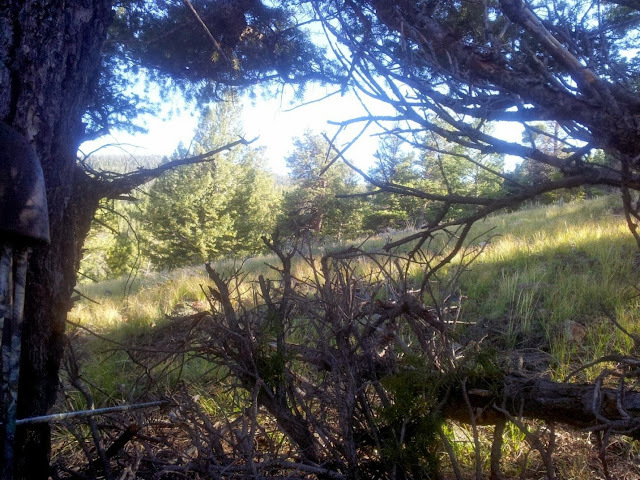 In fact this area turned out to be the steepest and most brutal mountain range I have ever hunted. It is no wonder why the number of hunters is lower than most areas. Once we were back to Nebraska, and fully aware that the terrain was more than we anticipated, we began to train hard. I am sure the unit is a place where many people only hunt once due to the difficulty (might be that way for me!). If there is a flat spot we did not find it. On the last Friday of muzzleloader season we drove out to Colorado Springs and met up with another friend Matt. That night we packed into the area we scouted weeks earlier. While the guys were setting up camp I hiked up the hill south of camp and set up the spotting scope. I was watching a herd of 15 bighorn sheep to the north but no elk. 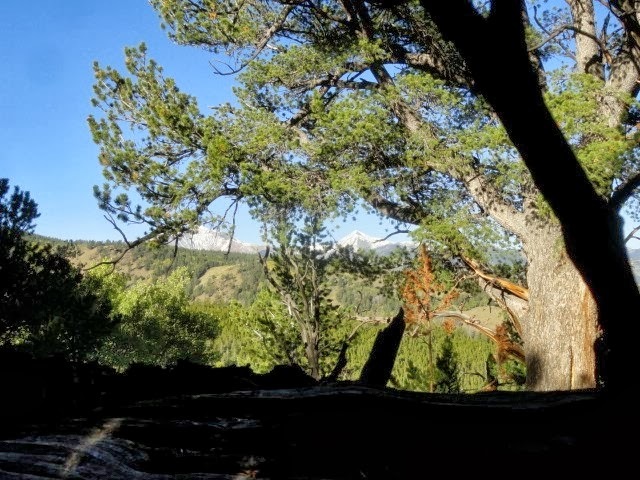 I decided to climb up onto a shoulder high rock outcropping behind me and glass to the south. As I got to the top I saw movement 15 yards ahead and immediately thought it was a coyote. I was wrong! A mountain lion was crouched down and staring directly at me. With my bow on the ground below the rock outcropping I thought he had me. Once we made eye contact the lion turned and slinked off. I told myself that he was not stalking me, that our encounter was random. That story makes me feel better anyway. 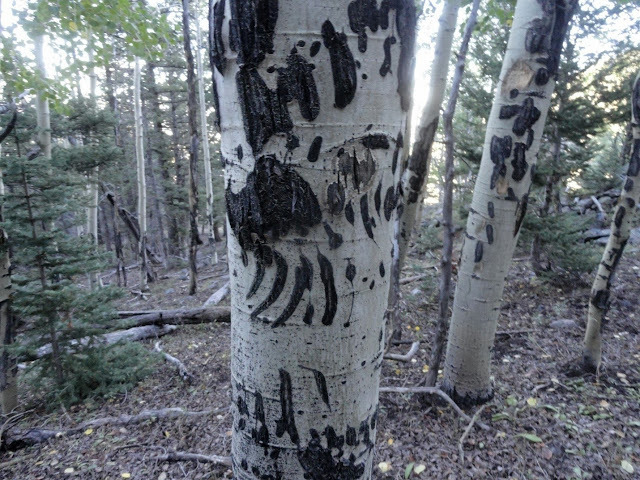 Bear claw marks on tree. The area was full of bear and lion sign. The next day we covered some serious miles and did not find fresh elk sign of any kind. It was a brutal hike, totally demoralizing, and after just one day we were all physically wiped out. The combination of shale rock, oak brush and extremely steep hills make this place very difficult to hunt. We made the decision to pack out Sunday morning and try plan B, a new area further north. When we got to the new location Sunday afternoon we set up camp and set out, again. The rain began immediately. I absolutely love hunting elk in the rain so Matt and I continued on while Devlin and Blake elected to wait out the rain in the truck. Not far up the hill we heard a bull bugling and the chase was on. It was very hard to keep up as the elk were on a nearly vertical hillside - full of loose rock and deadfall. I decided to switchback well south of the elk and then, hopefully at the elevation of the elk, switchback again to the north. Matt stayed behind to call. As I started north I saw antlers just 25 yards ahead. A nice 5X5 stepped onto the trail but presented no shot. 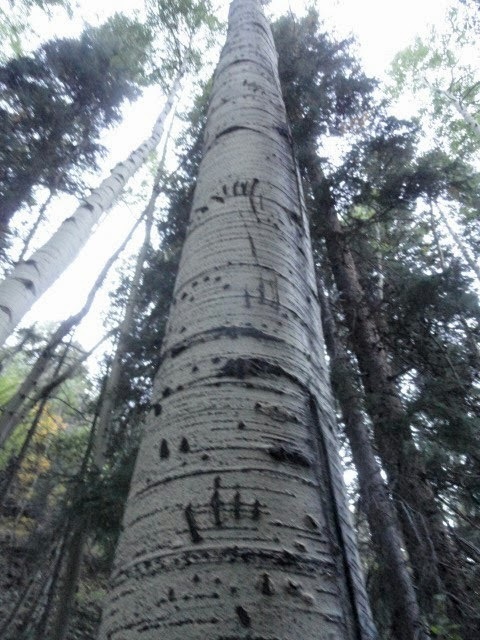 I slid out from under some branches to get a shot just as another, and much larger 5X5, stepped onto the trail. He was quartered away at too steep of an angle. They fed up the hill and never offered a shot. I followed behind but could not keep up. The wind turned uphill, towards the elk, so we backed off for the night. Tree burned in recent fire. Monday morning all four of us headed back to the same spot. We spent the morning trailing the herd and stopped a couple of times to call. Blake and Matt called in a small bull to 50 yards before the wind switched and the bull blew out. With the full moon the elk were bedding very early in the morning and coming out very late in the evening leaving a bunch of time till kill mid day. Blake and I killing time mid day. He nearly smiled for this picture, it would be the first time in years. That afternoon we split up, Matt and I headed east while Blake and Devlin went west. Immediately Matt and I found the herd bedded down. There were 2 bulls and 10 cows. One bull was a respectable 6X6 and the other was the smaller 5X5 I nearly shot the day before. Matt backed off to call and I set up for a shot. Matt did some soft cow calls with no response from the elk. We trailed the elk to a small park where we put them to bed. Matt stopping for a rest. The bulls just before dark. The cows came out shortly later. Tuesday morning we woke up at 4am. Matt and I hustled up the hill to get between the park where we last saw the elk, and their bedding area. It was a cold, windy morning and we never saw an elk. At 11:00am I thought I heard a bull raking a tree just 100 yards above us, but the wind made it difficult to know for certain. 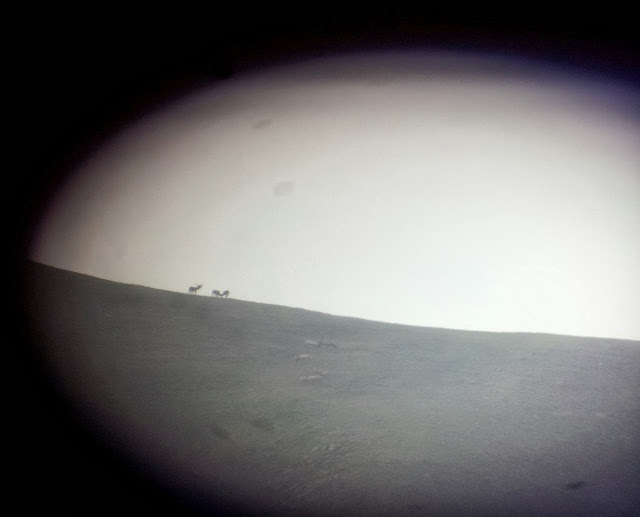 That night we set up ground blinds on the downwind side of the small park the elk were feeding in the night before. At 4:30pm a bull bugled within 100 yards of me. "Game on" I thought, and I began to get nervous. It was a long, cold and windy wait until dark...the elk never appeared. We went back to camp dejected, again. Blake and Devlin came back shortly after and said the bulls were bugling in the park we just left. On Wednesday morning we decided it was time to quit playing it safe and make a move on the elk. The wind was blowing hard with 30 to 40 mile gusts, and from prior experience in the never ending Nebraska wind, we knew that it would be a perfect day to stalk the elk in their beds. Our movement, scent and sound would be covered by the wind. Matt stayed in the tent with sore feet while Blake, Devlin and I headed up the hill. We still-hunted up through the park, and into the area we thought the elk were bedding in. We were within 100 yards of where I set up the morning before when I saw the same 5X5 working his way down the hill, right to us. He would bed down, then stand up and move a little, and then bed again. He was searching for the perfect spot to spend the day. We were going to make a stalk when Blake stopped me. The bull was up again and moved out of sight. From our experience the last couple of days we figured that the bull could not be called with cow calls so we decided to bugle at him. Blake went 20 yards right, Devlin went 20 yards left and I crawled over a deadfall that was blocking any chance I had at a shot, so I thought. Once we were set, I bugled. The bull immediately popped up and came crashing down the hill. He stopped behind a tree 10 yards away. If he went to my right I would have no shot, but Blake would get him. If he walked to my left either Devlin or I would have him. He decided to go left and stopped just 8 yards away from me, too short for Devlin to get a crack, so I did what I had to do. Everything felt like slow motion as I drew back and released the arrow. It was a good shot, a clean pass through. The bull ran 15 steps, spun in a circle then reared up and fell over backwards, not 20 yards from Devlin. When my lips quit tingling and the dizziness stopped I thanked God for a successful hunt and the chance to share it with good friends. The guys ran up and we hugged and high fived. It was awesome to see that my friends were just as happy for me as they would have been if they had shot the elk. I was shooting a Basset Bad Medicine Recurve, 61# @ 28, Carbon express arrows, with 200 grain STOS broadheads. The arrow continues to be my lucky one, I have killed 6 deer, a turkey and now an elk with this same arrow. And now here is Devlin's account of his first elk hunt. Before I get into detail, I would like extend a huge thank you to the boys at Rocky Mountain Specialty Gear, Chad Graham, Blake Bethel and Matt Lutgen for making my first, and definitely not my last, archery elk hunt, one of the most memorable experiences of my life. It all started when I was blessed to be invited by Chad and Blake to go hunting with them. I can’t remember when it was, just that I was floored to get invited, and the excitement for the upcoming hunt grew tremendously. I had heard that Chad and Blake were building recurve bows and really didn’t give it much thought until I saw the riser that they had made for Tommy. From that point on, I knew that I wanted to be shooting a recurve. It had been years since I last shot a recurve bow, but with time, I hoped that I could get in enough practice to be proficient enough to harvest an animal. Chad and Blake built my beautiful bow and the boys at RMSGear hooked me up with everything I needed to start flinging arrows. Also, the boys at RMSGear were able to equip me with my Horne Hunter full curl pack, custom arrows and endless other “goodies” I needed for the 2013 elk hunt. The fellas at RMSGear treated me more like family than they did like a customer. Beings that I had never done anything like this in my life, I relied on the experience and know-how of the boys at RMSGear, Chad and Blake. They all supplied me with a list of items that I needed and the whole time relating some of their past experiences in elk country and what I should expect. 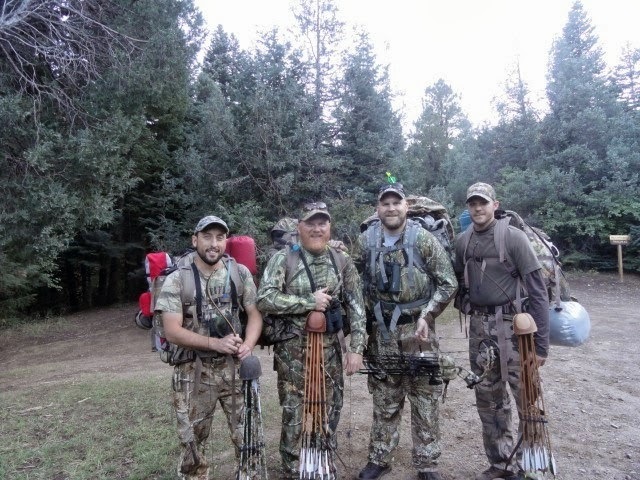 After hours of practice, lessons from Chad and Blake, and continuing to hear great experiences of elk hunting, I was ready, so I thought, to go on our scouting trip. WOW, I really wasn't as ready as I thought. The two days that we spent in the mountains proved to me that I had a lot work ahead of me and a short amount of time to do it. With that first experience behind me and a drive to get into better shape, I started. I threw on my loaded pack, called Chad and we started walking and running hills in a local park. Countless hours at the gym in the weight room and on cardio equipment, I was slowly preparing myself for whatever I was to get into. Finally, the day came. With great anticipation and knots in my stomach, we turned the truck west and headed for the mountains. I feel extremely blessed to able to experience what God has given me and the fact that I was heading to the mountains with great friends and with echoes of elk looming in my dreams, was such a feeling of exhilaration. 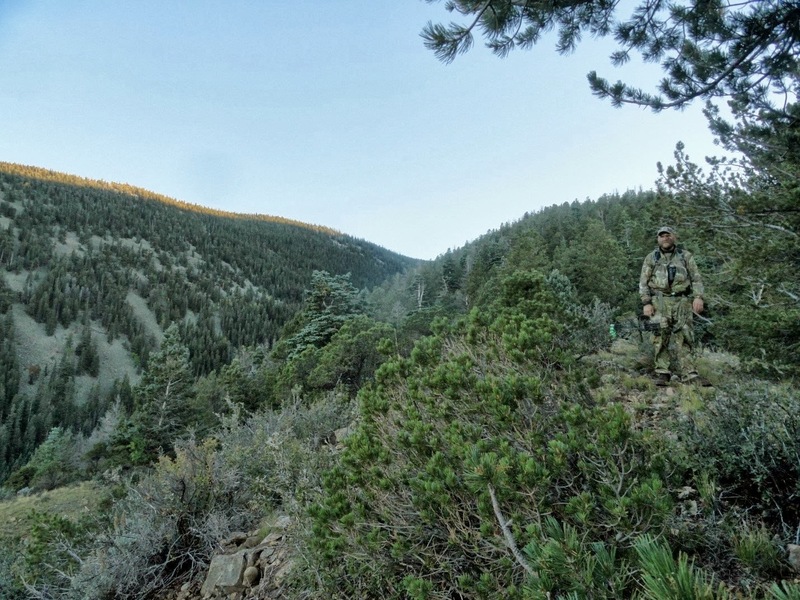 Breathing in the mountain air, losing yourself in the pines and aspen groves, relaxing from the hustle and bustle of everyday life is what hunting is to me. Harvesting an animal is icing on the cake, it’s a bonus. The hunt was better than I had imagined. 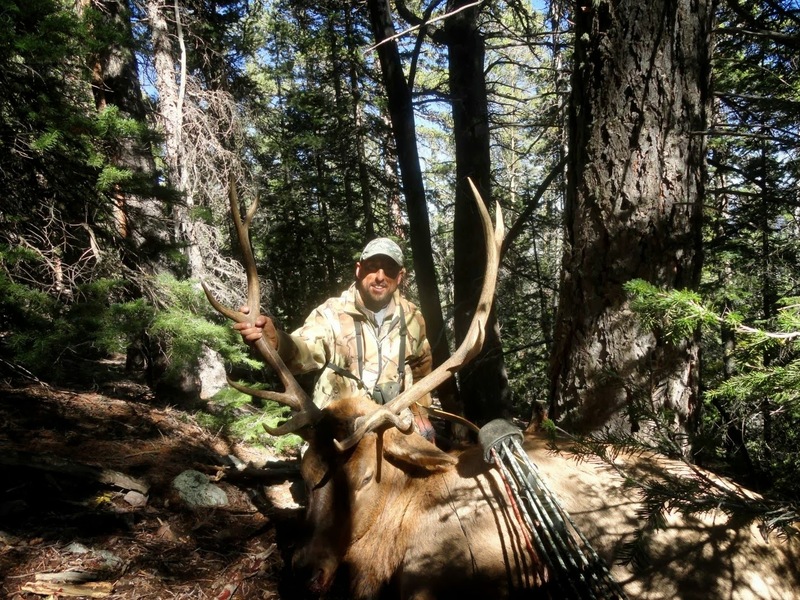 We were five days into the hunt before I saw my first elk and as luck would have it, that was the elk that Chad killed. It’s impossible to put into words what that experience was like. It was surreal, almost as if it were an out-of-body experience. I couldn't believe I was there and what I was able to be a part of. Even though it was tough, sore muscles, sore feet, cold, hot, windy, I would do it all over again, and hopefully will. Again, thanks to Chad, Blake, Matt, Tom, Tommy, Danny and the RMSG fellas for all that they have done to make my first elk hunt a reality. It was such an experience that I can hardly wait to see how the next, of many, will unfold. thank you for your story. i am a pastor in Gainesville, Ga close to atlanta. i have a beautiful wife and 6 amazing kids. two of them we adopted from ethiopia. life is controlled chaos. lol! 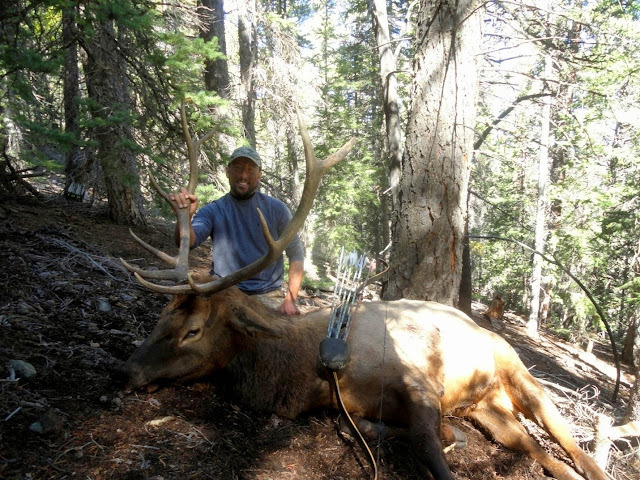 i have had a dream to take an elk with my bow for 20 years. hearing your story gets me fired up and excited about fulfilling that dream one day. i love hunting with the bow. nothing like it. thank you for sharing and i hope you get to go again! I'm hoping to make it out there maybe next year, lord willing and the creek don't rise. God bless and take care.